Adrenal fatigue often accompanies thyroid imbalance. In fact, stressed adrenal glands can cause a thyroid disorder and vise versa. 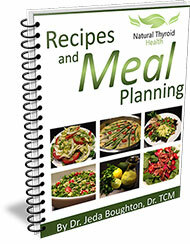 Therefore, it’s important to support your adrenals and your thyroid at the same time. When addressing an imbalance, when possible, start by identifying and eliminating the cause. Chronic stress – Your body is designed to cope with short periods of acute stress. High levels of stress that is prolonged can weaken your adrenal glands. Without breaks to recuperate and refuel, over time, you can burn out your adrenals. Poor eating habits – Extreme fluctuations in blood sugar, foods lacking nutrients and inflammation and absorption issues will all affect your adrenal function. This disturbance to your digestive system can actually cause physiological stress on your body, which, as you know negatively affects your endocrine system. Poor sleep hygiene – The number of hours, the quality and even the time of night that you sleep will impact your adrenals. Staying up late, night after night, even if you sleep late in the morning is stressful for your body. As you can imagine, people who do shift work have added stress. Prolonged and extreme changes to your natural circadian rhythm messes with your hormone balance. Lifestyle shifts can help heal and support your adrenal glands. Manage stress – Be aware of the amount of time that you spend doing strenuous tasks. Consciously plan several fun activities in your week. Don’t get caught up in the “When this is done …” or “If only I had …” stories that we can tell ourselves. Today, right now, schedule something that you will look forward to. Eat a balanced diet – Cut out processed foods and refined sugars. Eat plenty of green and colourful vegetables and choose squash and root vegetables in place of grains. Make sure you get a healthy portion of protein, eat regularly throughout the day and never skip breakfast. Practice healthy sleep habits – For most people the ideal sleep time is from 10pm to 6am. At the very least, try to go to bed before midnight and keep a regular sleep schedule whether you’re on vacation or not. Consult with an experienced health care professional – Everyone suffering from adrenal fatigue and thyroid imbalance is different and will require a unique treatment plan. If you have Hashimoto’s Thyroiditis and are considering a natural treatment protocol, talk to a competent natural health professional who specializes in endocrine health.